As a leading intermodal rail transportation provider, we offer competitive railroad shipping rates and seamless railway freight services across the United States. Shipping by train for businesses throughout North America helps to cut transportation costs by providing an alternative to over-the-road (OTR) shipping. 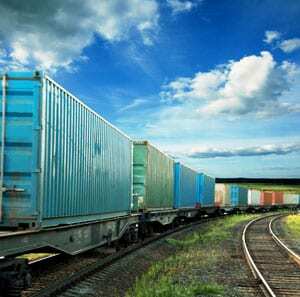 Rail shipping is a long-term supply chain solution that can provide door-to-door service and economic value for businesses looking to keep pace with increasing consumer demand. Some of the other benefits of intermodal rail freight include increased security and a reduced risk of weather delay and cargo loss. Since less carbon-based fuel is used when rail shipping, it is also better for the environment! Intermodal transportation involves moving freight using two or more modes (trucking, rail, or ocean) without handling the freight. Intermodal freight shipping combines the best features of two seamless transportation modes to deliver service, solutions, and savings to shippers. If you require scalable capacity and door-to-door service, call us to learn more about our intermodal solutions. Yes, shipping by rail can reach your business’ doorstep – it appears seemingly like a full truckload, door-to-door service. Step 4. At the rail ramp, the rail container is transferred via truck to the final destination. Typical transit time for coast-to-coast delivery is 7 to 10 days. Trains operate on a regularly scheduled service throughout North America. BGI offers shipment tracking so your freight is monitored from origin to destination.